A less well-known Thai noodle dish is creamy coconutty Mee Kati, Rice Noodles in Coconut Milk. Here’s our step-by-step authentic Thai recipe. Continuing on with our step-by-step Thai cooking videos, learn How to Make Perfect Pad Thai Sauce with our step-by-step authentic recipe. 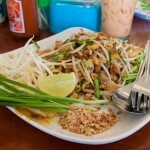 Pad Thai is Thailand’s most famous food export, but the history of Pad Thai might be a bit of a surprise. Pad Thai exemplifies the balance of sweet, hot, salty, sour, and bitter flavors that is key to Thai cuisine, while creating an interesting mix of textures from the cooked noodles, crisp bean sprouts, and crunchy dried shrimp. Some stands are even creating new Pad Thai varieties out of green papaya!